Marvel’s little slice of the Star Wars galaxy is getting a little bigger. Just like Princess Leia and Lando Calrissian before him, another hero is getting their own solo comic: Chewie himself! Laugh it up, fuzzballs. 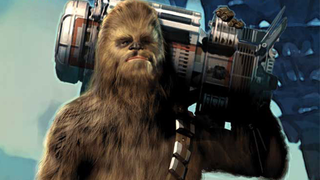 Written by Deadpool’s Gerry Duggan and with art from longtime Marvel star Phil Noto, the Chewbacca series is set immediately after the events of A New Hope. On a solo mission (that’s little “s”, rather than a certain Corellian scallywag) for the Alliance, everyone’s favorite Wookiee finds himself crash-landing on a resource-rich world that the Empire have set their greedy mitts on, causing Chewbacca to align himself some local rebels to stave them off while he gets his ship fixed. For those worried about the idea of a comic with a protagonist that can’t speak English, don’t worry—although Chewie’s roars won’t be translated, he will encounter some new friends who can understand him. It’ll be just like the movies! Personally, I can’t wait for Chewbacca to cross over with the Groot series. Can you just imagine the dialogue in that book? Chewbacca #1 will be in stores this October.